I like to call the Mr Clean Magic Eraser cleaning pads the 8th wonder of the world! As miraculous as this little tool is, I still come across people who remain ignorant to its existence never mind the endless usefulness of these amazing wonders! 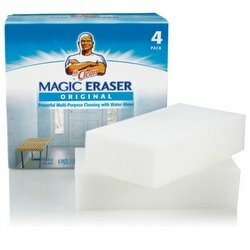 Made from the raw product called Basotect and produced by the worlds largest chemical company BASF in Germany, this material is most commonly labeled as the Magic Eraser but is private labeled under endless names. I now refer to this "tool" as the 8th wonder of the world as it goes against all logic in its amazing abilities to clean surfaces and stains where traditional cleaners and cleaning cloths prove ineffective. I have been using these amazing "tools" in my professional detailing business and continue to find more and more uses. Delivering better results in the detailing process while at the same time saving time and effort is a winning combination. Remove black scuffs; threshold plates, seating, center console, etc. Road grime along rocker panels. Can be used dry, but not recommended. Will abrade certain surfaces if used with enough pressure and enough rubbing. You control the amount of cleaning abilities with the amount of pressure and rubbing. I can take the cleaning abilities of the Mr Clean Magic Eraser to higher levels of performance by using with the right cleaners. The Mr Clean Magic Eraser is an amazing and useful "tool" by itself...but you can take it to the next level by using it with an effective cleaner. The (2) cleaners above are professional grade cleaners and since they are used by professionals, they are concentrates and come in gallon size only. Due to the fact that I have so many uses for each of them, I think most people will find more than enough uses when cleaning their cars or even around the house. Want to learn more and more free auto detailing tips? Don't forget to subscribe to my YouTube channel and pass this information along by sharing to your favorite site or blog; I bet you know of at least one other person that would benefit from this info.